Curries - spicy, flavorful, eye-watering Indian curries - were brought to KwaZulu-Natal by sugarcane laborers shipped over from India by the British colonialists of the 1800s. These immigrants brought with them the traditional cuisine of their homeland; but when their contracts were up, many chose to remain in South Africa. As a result, there is now a thriving Indian population in Durban, the urban jewel of the country's tropical northeast coastline. Indian culinary customs have become an integral part of the city's culture - so much so that Durban is now just as famous for its curry restaurants as it is for its golden beaches and iconic surf spots. Sampling curry is an essential part of the Durban experience, and in this article, we look at some of the best places to do just that. Gounden's has an uninspiring greasy spoon exterior, and the interior decor isn't much to write home about - but it's what's on your plate that counts. The restaurant's enduring popularity is indicated by packed tables filled with locals. The menu is simple, but the curries are both authentic and delicious. 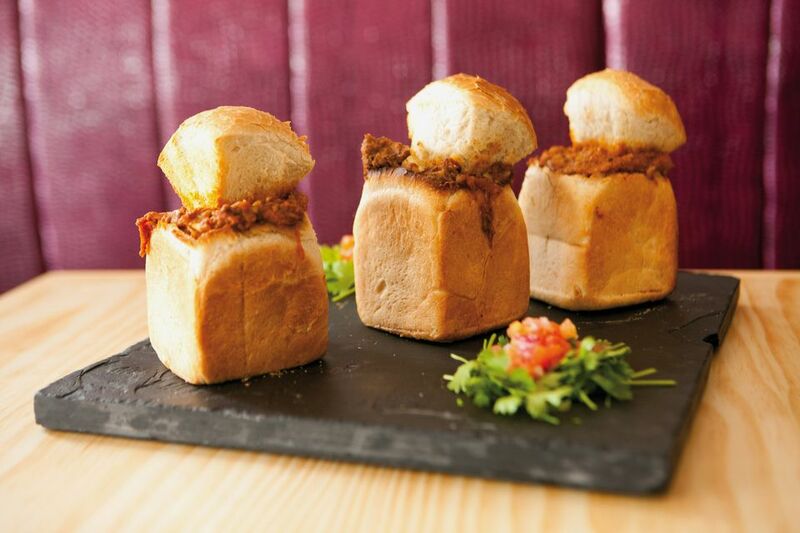 Sides include roti and rice, but the most popular choice by far is the bunny chow - a Durban specialty comprising a hollowed out half or quarter loaf filled with fragrant curry. Portions are generous and prices are modest, making Gounden's a top choice for those on a budget. If you're looking for something slightly more upmarket, try The Little India Restaurant on Musgrave. The restaurant's contemporary dining room is made cosy by atmospheric fairy lights and the wait staff's warm service. If you're new to Durban curry, your waiter will talk you through the menu options, so that you know exactly what you're getting into. The menu is extensive, offering regional specialties including Manchurian-style curries and dosas (rice flour pancakes) from South India. There is also a wide choice of vegetarian and seafood options. On TripAdvisor, Mali's is currently Durban's highest-ranked restaurant across all cuisines - and for good reason. Situated inside an unassuming residential house, Mali's sets a simple scene with saffron-colored walls and rustic wicker chairs. The focus here is on the service, which is attentive, friendly and endlessly knowledgeable; and on the food, which is crafted with impressive dedication to authentic techniques. The menu is vast, but specialises in South Indian staples including dosa, idli (a kind of savory cake), and Chettinad curries. The bar offers local beers and a small selection of South African wines. Located in a less-than salubrious street and covered in multi-colored signs announcing ludicrously low-priced specials, Sunrise Chip n' Ranch doesn't look like much. However, it's open around the clock and has earned a reputation for the best cheese and chip rotis in town - especially after a late night party (or jol, as they're called in South Africa). Fondly referred to as Johnny's by native Durbanites, Sunrise has been a local institution for over 50 years. It's takeaway only, and curries and bunny chows also feature alongside the restaurant's famous rotis. There's a second Sunrise branch in Mowbray, Cape Town. Although most Durban curry restaurants include at least a few vegetarian options on their menu, it's nice for non-meat eaters to dine at a place dedicated entirely to their satisfaction. Patel's Vegetarian Refreshment Room fits the bill perfectly, exclusively serving meat-free curries and handmade sweets since 1915. The vegetarian and bean bunny chows are famous city-wide and regularly sell out - so you'll need to be quick off the mark to beat the lunchtime crowd. There's nothing fancy about Patel's or its surrounds, but the quality (and price) of the food makes this spot a firm Durban favorite.